On Monday, the City Council of Bologna, Italy’s seventh largest city, approved a motion in support of concrete action to hold Israel accountable for violations of the rights of the Palestinian people, as stipulated in international law. The motion urges the Italian government and European institutions to "commit to suspending supplies of weapons and military equipment as called for by Amnesty International." The motion passed by a wide margin, with 23 votes in favor and six abstentions. The motion recalled the over one hundred Palestinians killed and 10,000 wounded in recent weeks by Israel’s "harsh repression" of "peaceful protests" by tens of thousands of Palestinians in Gaza against Israel’s occupation and illegal blockade of Gaza and for the UN-sanctioned right of return of Palestinian refugees. The Council also recalled the transfer of the US embassy to Jerusalem, despite the UN General Assembly resolution against the decision approved by a wide majority, including Italy. The motion noted how the decision of the organizers of the Giro d'Italia to start the cycling race from Israel provoked "a wave of indignation" and "had, in fact, contributed to supporting the position of said country, backed by the US, which claims Jerusalem as its unified capital in violation of international law." The councilors called on the international community to work "to compel Israel to assume its responsibilities as the occupying force." Italy is a major supplier of weapons to Israel and maintains strong military research and intelligence activities with it. According to the Italian Disarmament Network, in 2014, Italy was the EU's leading arms exporter to Israel. Collaboration between the Italian and Israeli war industries continues to grow, with "technology transfers", training, joint exercises and maneuvers, conducted on Italian soil and in areas under Israeli control. Italian law 185 of 1990 prohibits the sale of arms to countries in a state of armed conflict or to countries "whose governments are responsible for documented violations of international conventions on human rights." 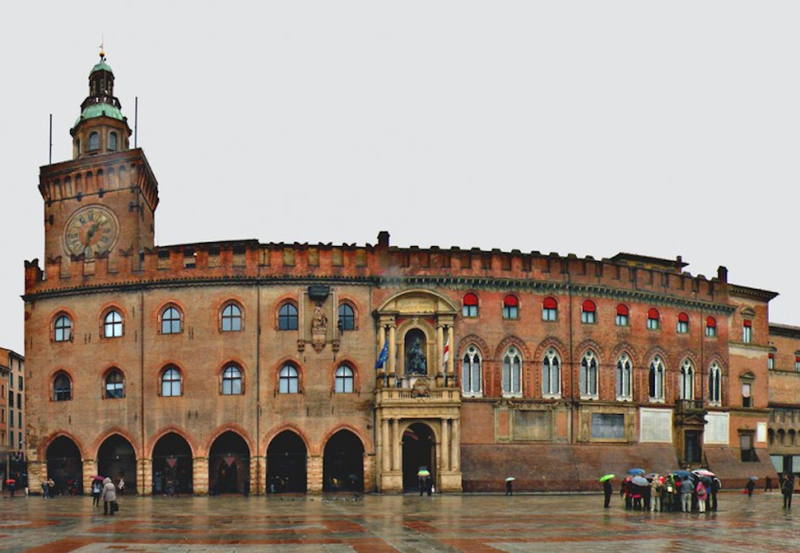 With Bologna, three Italian city councils have so far called for a military embargo against Israel. 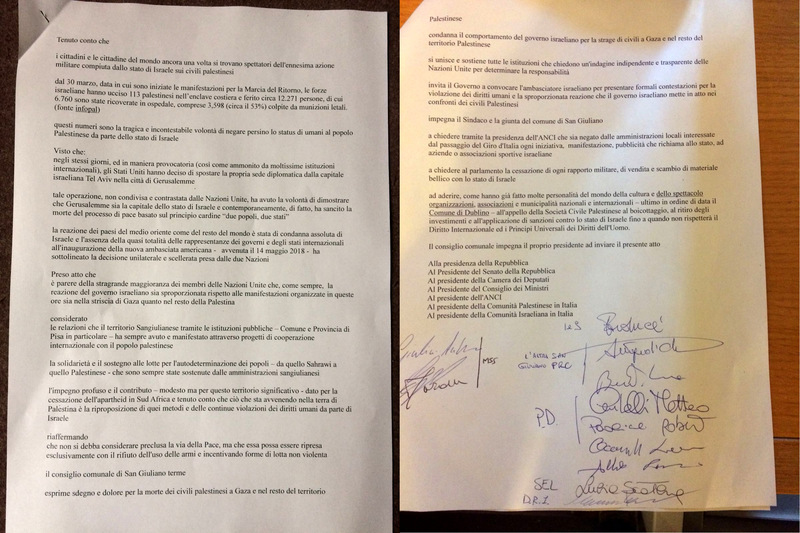 A few days ago the City Council of San Giuliano Terme (Pisa) approved a motion calling on the Italian parliament to "end all military relations, sales and trade of war material with the state of Israel" and endorsed the Palestinian civil society call for boycott, divestment and sanctions (BDS) for Palestinian rights. Last year the City Council of Florence unanimously approved a motion calling on the Italian government and the European Union “to end all forms of technical and economic cooperation connected, directly or indirectly, with the Israeli military” and with illegal Israeli settlements. The motions approved by Italian city councils come amid similar measures called for internationally in recent weeks as an effective means to hold Israel accountable to international law standards. The Spanish party Podemos called for a military embargo against Israel, while Jeremy Corbyn, leader of the British Labor party, has reaffirmed his party's commitment to review arms sales to Israel. In Ireland, the Dublin City Council approved a motion endorsing the BDS movement. BDS Italy congratulates the City Councils of Bologna, San Giuliano Terme and Firenze for their commitment to enforcing respect for international law and human rights. In particular, their calls for concrete action, such as a military embargo against Israel, are necessary more than ever, considering the total contempt on the part of Israel for Palestinian lives and its utter disregard of international law. We call on all Italian local administrations to follow the example of the city councils of Bologna, San Giuliano Terme and Florence, approving similar motions calling for effective and concrete measures to ensure respect for human rights, international and Italian law. This is not simply about solidarity; it is about Italy meeting its legal obligations to cease aiding and abetting Israel’s war crimes and serious human rights violations.